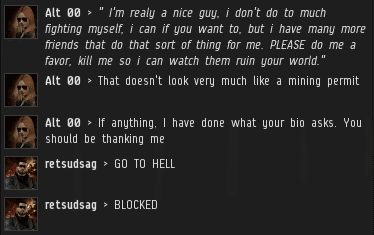 Highsec can be a wild, unruly place. Only the Agents of the New Order are powerful enough to tame it. 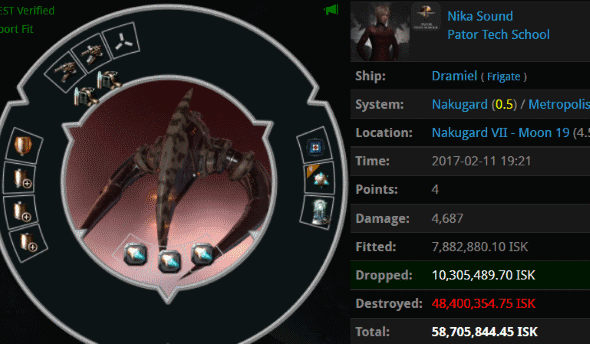 Agents Alt 00 and Alt Proxy detected a hostile Dramiel in Nakugard. Since they love to shoot ships that can shoot back, they eagerly went into battle against it, and won. 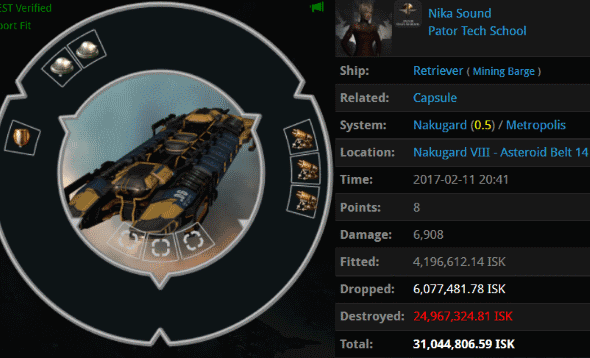 You see, barely an hour after our Agents ganked the Dramiel, Nika went into the asteroid belts with a Retriever--as if a mining barge is a safer option. Like I said, highsec needs taming. Despite the strangeness of the miners' culture and their carebear logic, our Agents are making deep inroads. 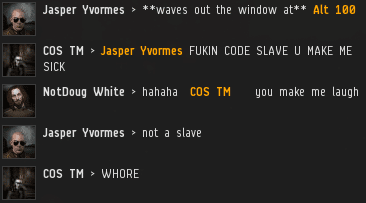 Increasingly, highsec PvE'ers are adopting the Code--embracing it, even. 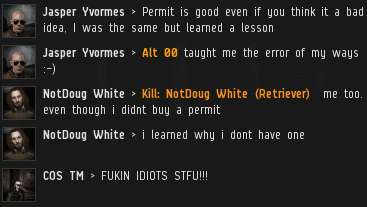 They encourage their fellow miners to buy permits. But not everyone is happy about the direction things are headed. Take retsudsag, for instance. 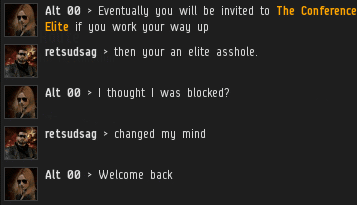 He saw highsec's march of progress and thought it was a bad thing for some reason. retsudsag was furious to have his own bio's words used against him. In other words, he was a hypocrite. When someone says they're blocking you, nine times out of ten they haven't really blocked you. If someone tells you about the "block", it's because they still care. The ones who really block you don't say anything; they just do it. retsudsag had chosen to leave a channel of communication open--just a crack, but still open. 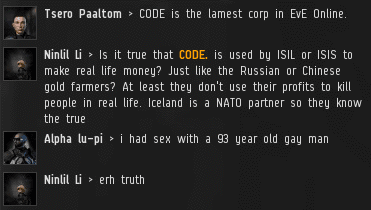 Alt 00 was confident that deep down, a little part of retsudsag knew the Code was right. 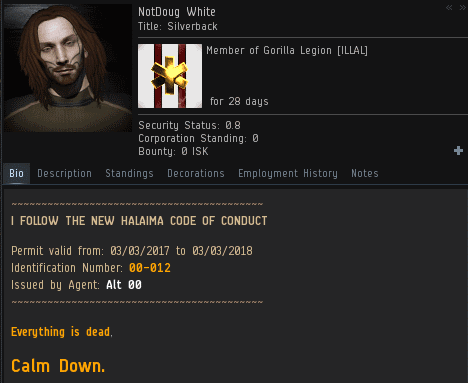 An epilogue: NotDoug White eventually chose to follow the example of his friends and corpmates by buying a mining permit. And as for retsudsag? 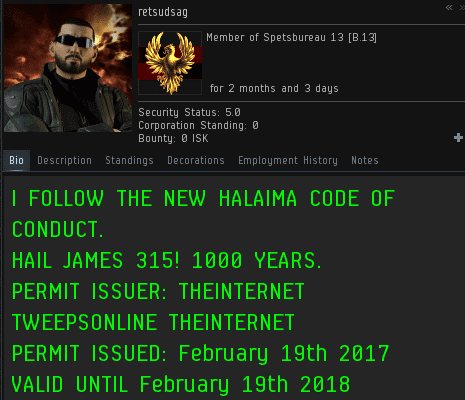 After losing a second Hulk to another group of Agents two days later, he deleted his old bio and replaced it with a mining permit. One hundred percent Code compliance isn't some crazy dream; it's a given. And the day is coming soon. Kann es sein, das ihr alles verkappte Faschos seit? You got a mouth full of what? Could it be that the German crybear is gonna call us fascists? Now that's lulzy! seltsam nur, das hier jeder seinen Senf dazugeben kann. The New Order is just so full of Win. 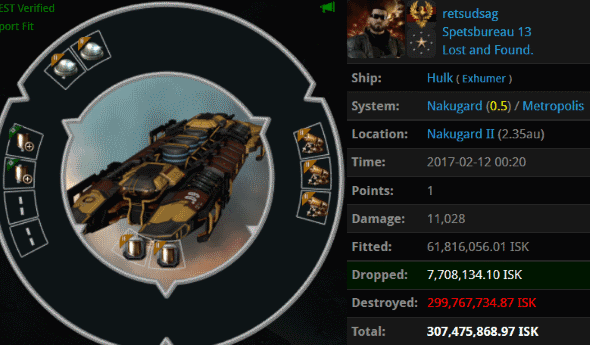 Good work Alt 00! Do you even gank anymore bro? Ninlil Li seems almost convinced that CODE is ran by the ISIL or whatever. That dumbass could help us all by eating a bullet. Autocannon... in game of course. Calm down miners. 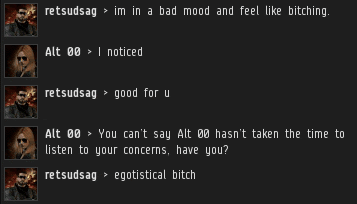 Great job Alt 00. Your conversion rate is sky high. Probably because you're consistent and always willing to help. Who wouldn't want to be on your side. Ist halt eine richtige Führernatur. Wer möchte da nicht mitmachen? Die Deutschen haben Ihre Lektion bekommen. "Die Deutschen haben Ihre Lektion bekommen." What do you say to a German with two black eyes? Nothing, you have already told him twice. "What do you say to a German with two black eyes? Nothing, you have already told him twice." was sagt denn dein Führer dazu?